Lock in a great price for Liaison Washington Capitol Hill – rated 8.3 by recent guests! The location was amazing! Walked to national mall, union square. The valet parking was very convenient. Staff was excellent and helpful. We were able to check in early because of travel circumstances beyond our control. Staff met needs as requested when possible. great location, minutes from Union Station and from the Capitol. 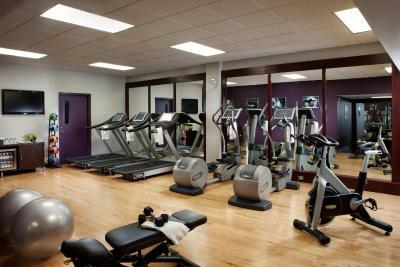 Friendly staff, large room with 2 Queen beds. Comfortable beds, good mattresses. Clean hotel, good atmosphere,....fair price. Would come again. Many good food options in Union Station. The location was great for getting around but the bathroom needs updating. The brunch was AMazingggggg!!!! Staff was so attentive! Happy had a nice selection and excellent female bartender! Wish I remembered her name:(? Very comfortable room and the staff was on point. Staff was friendly and accessible. It was a great experience from check in to check out. The location of restaurants to the hotel. Walking distance to the Capitol One Arena. Friendly staff, very well located just walking steps from Union Station and the restaurant was amazing. Location was great and the staff were friendly and helpful. Liaison Washington Capitol Hill This rating is a reflection of how the property compares to the industry standard when it comes to price, facilities and services available. It's based on a self-evaluation by the property. Use this rating to help choose your stay! The Liaison Capitol Hill is located in Washington, D.C., just 2,500 feet from the United States Capitol Building. The hotel's rooftop pool and lounge is open from late May through early September. Guest rooms at The Liaison Capitol Hill are furnished with modern decor and are equipped with WiFi and an iPod docking station. Liaison Capitol Hill is the site of Art and Soul Restaurant, which serves traditional Southern cuisine and offers a seasonal outdoor patio. The Art Bar features cocktails, wines and a light menu. The Liaison Capitol Hill offers a concierge service for assistance with sight-seeing. 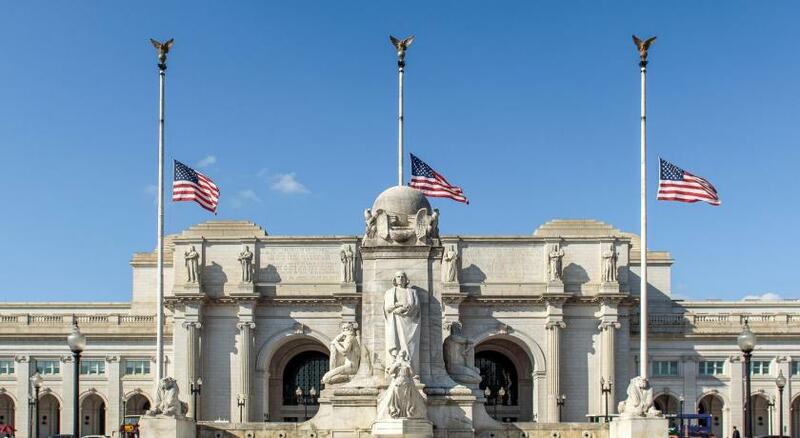 The Union Station Metro stop is 1,200 feet from Liaison Capitol Hill and provides easy access to numerous D.C. sights. The Smithsonian National Museum of History is 1 mi from the hotel. 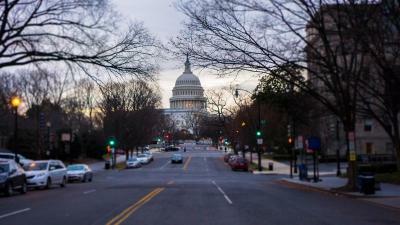 When would you like to stay at Liaison Washington Capitol Hill? This air-conditioned room with 1 king bed has a flat-screen TV with cable channels, a work desk and a private bathroom with free toiletries. Private parking is available on site (reservation is not needed) and costs USD 59 per day. This air-conditioned room has 2 queen beds and is equipped with a flat-screen TV with cable channels, a work desk and a private bathroom with free toiletries. This air-conditioned room has 2 double beds and a flat-screen TV with cable channels. This premium room with 1 king bed is equipped with a bathrobe and slippers. A coffee machine, flat-screen TV with cable channels and free toiletries are provided. This accessible room with 1 king bed has air conditioning, a flat-screen TV with cable channels and a private bathroom with free toiletries. This accessible room with 2 queen beds has air conditioning, a flat-screen TV with cable channels and a private bathroom with free toiletries. This air-conditioned room with 1 king bed has a work desk and a flat-screen TV with cable channels. This double room has air conditioning, bathrobe and flat-screen TV. Our perfectly located hotel offers both leisure and business guests the opportunity to really see as much of the city as possible. Within a short stroll of the Capitol Building, and plenty of bars and restaurants, you can enjoy Washington D.C at its best. Conveniently located near to D.C.'s main train station, the metro service allows to get around the city in minutes, and Amtrak services are available to all major East Coast Cities. The White House, Smithsonian museums (free), and the National Mall are all a short walk away. Spend a little longer with us, and you will have the opportunity to relax by our unique roof top pool - a haven of pure bliss. We look forward to welcoming you whatever your needs. Hotel surroundings – This neighborhood is a great choice for travelers interested in city walks, culture and museums – Check location Great location - show map Guests loved walking around the neighborhood! House Rules Liaison Washington Capitol Hill takes special requests – add in the next step! Liaison Washington Capitol Hill accepts these cards and reserves the right to temporarily hold an amount prior to arrival. The swimming pool is available for swimming from Memorial Day weekend to the Labor Day weekend, from 8:00 to 17:00 hours. The Hotel Facility Fee covers WiFi, local and long distance phone calls, Business Center access, access to the Press Reader, which allows you to download 5000+ newspapers and magazines in more than 60 languages and daily Coffee at our Morning Grab and Go available from 7:00am - 10:00am daily. Please note that only guests 21 years or older are allowed in the Rooftop Pool Deck after 21:00 hours. 135 people are currently looking for a place in Washington, D.C. Location just few steps from capiton . Friendly staff and very clean rooms! 59 dollars a day is a lot of money for parking. However I realize I’m in DC and things are more expensive. Also, food choices are limited in my opinion. We left to eat or brought in food. The overnight parking is expensive $59.00 a night which adds up if you stay a few nights. The location is absolutely perfect ! Everything is awesome. Super close to the train station and Capitol Hill, the food at the hotel restaurant Art and Soul is delicious. We were a bit of a distance from the main sights and shops/restaurants but we chose this hotel because it was near the railway station and we were arriving by train. The lack of near by restaurants was a bit of a surprise but the hotel did have its own restaurant and the bar provided some meals. I was emailed that I could have a handicapped room.. When I got there, they had no record of it and put me on the 10th floor. Very difficult for someone in a wheel chair. Our tub dirty and glaze was coming off. For a classy hotel, they missed a lot. The bathroom was small. There were no glasses, just paper cups; though, they did deliver some wine glasses for us. Finally, there was a "resort charge" of $25/night which covered WiFi and nothing else that we used. I suppose all this is typical for big city hotels. The location was perfect. The elevators were great, no waiting. Everyone was friendly and helpful. The bathroom had water damage and rust stains. The water in the lobby was not Adequate for the amount of guests each time we needed to ask to have it refilled. The beds were super comfy BUT the sheets were too crisp as in poor quality. Mattress was wore out and sheets were load. Location and outside dining area. Rooms were dirty, bathroom was dirty. old furniture , old worn out coffee maker. Disappointed completely. If refunded I will be happy !! Only location was good Thats it!. Not clean,basic requirements were not met at all. Absolutely wasted my money! !